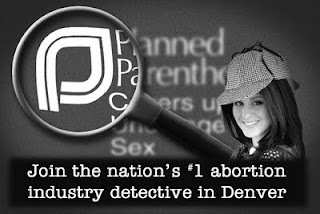 THE PASSIONATE PRO-LIFER TURNED ABOLITIONIST: More Lila Rose undercover! Many of you remember, we had super sleuth, Lila Rose as our banquet speaker this past September. Lila's latest undercover video - The Rosa Acuna Project has been released! More medical lies, manipulation and murder. To view the newest video from Wisconsin, click here! Congressional hearings on this medical fraud and abuse should be convened! Call your congress person.